Music from Ireland, Scotland, and Wales will be featured. 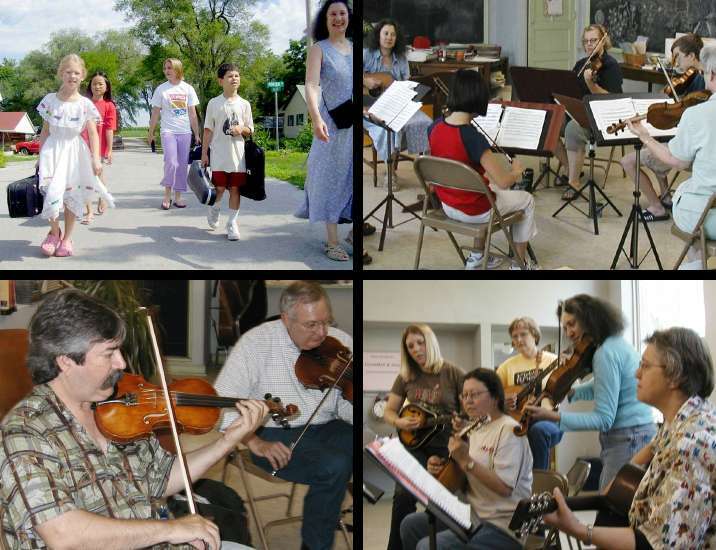 The Old Avoca Schoolhouse in Avoca, Nebraska will be hosting a special Celtic Fiddle Camp for fiddlers, violists, mandolinists, guitarists, recorder players, and ukulele players. The sessions will be led by championship fiddler and author, Deborah Greenblatt. Musicians can sign up for 1 day, or 2 days or all 3 days. On Wednesday, participants will be mostly reading tunes, using sheet music in standard notation. They will learn melodies, harmonies, and chords. Fiddlers will be improving their sight reading, and experiencing fiddling fun. On Thursday, the emphasis will be mostly playing tunes by ear, so feel free to bring your recording gadgets. Sheet music versions of the tunes will be provided for you by the end of the day, just in case your ears need the help. Full payment due on your first day of camp. If you think you have registered but do not receive an e-mail confirmation from Debby within 24 hours please e-mail her at debby@greenblattandseay.com to let her know. For folks who consider themselves beginners. to register for 2019 Summer Schoolhouse Fiddle Camp 1.
please e-mail her at debby@greenblattandseay.com. to register for 2019 Summer Schoolhouse Fiddle Camp 2.